What better way to give this Christmas but to share the pampering experience at Elite Nails, Hand and Foot Body Spa. 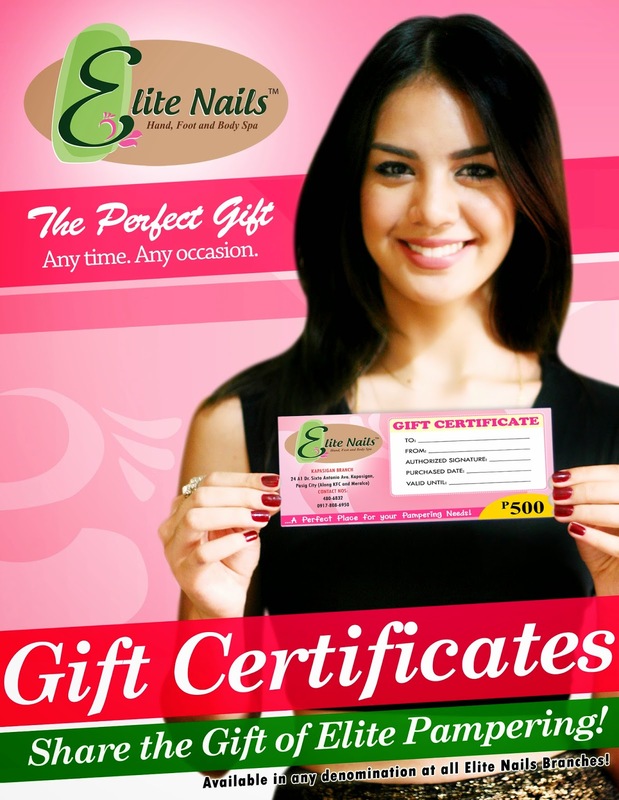 The Elite Nails Gift Certificate is more than just a gift. It’s the most thoughtful way of sharing pleasure and beauty. There are only few things that money can’t buy. So have your love ones feel like royalty without spending too much this season. The Elite Nails Gift Certificate comes in any denomination, make their wishes come true. Choose from foot spa to facial to body massage and many more. So put this first on your Christmas list. Save yourself from the holiday shopping rush, simply come and visit the nearest Elite Nails, Hand and Foot Body Spa and give the gift you yourself would love to receive this Christmas. Be smooth & hair free.. Visit Us! Dark Secrets? We Have Something for You! Early Christmas Gift at Your Favorite Nail Spa.